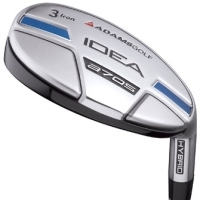 The Idea a7OS Hybrids are the absolute best game improvement hybrids Adams has ever made. You'll see increased distance, improved launch conditions and easy-to-hit playability. Ultra thin crown lowers CG. 44 Gram heel/toe perimeter weighting maximizes forgiveness. Thin face increases ball speed. Draw biased with new rounded shaping.